One of the most important jobs of a project manager is to manage a project’s budget and schedule. These tasks can easily be very difficult to accomplish on projects that are complex, especially since successful project execution relies heavily on people who are expected to perform their roles individually and as a team. One of the most difficult aspects of managing projects is estimating how fast and effectively humans will perform a task; that is, determining how productive workers collectively will be each day, each week, or within any time period during the life of a project. Because projects are unique and are typically one-off endeavors, there is usually little previous empirical data to rely upon for the project manager to forecast productivity before or during the project’s execution. The crux of the problem lies with adequately identifying not only the labor work flow process, but also the influences that affect the work flow process. When scope changes are introduced into the work flow of a project, the types and number of influences and their cause and effect relationships can significantly increase in numbers. This phenomenon often turns complicated projects into extremely complex ones and the final outcome can be greater than the sum of the individual inputs. For project managers who are unable to get their arms around this very real situation, forecasting the outcome of a project often becomes out of control, especially for projects that are large and heavily labor intensive. This study takes a post-positivist approach to design and builds a system dynamic model with which construction projects that are delivered using the design-bid-build methodology can be simulated to show generically how the influences that affect construction projects can affect worker productivity. 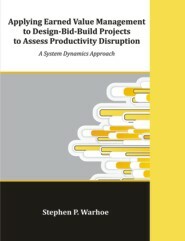 No other studies are known to exist that design or build such a model for construction projects that use the design-bid-build delivery method. The model that was designed in the study is based on the works of several academics’ works as well as the input of several experts in the construction field, including this study’s author. As opposed to attempting to create a simulation model based on the uniqueness of a single project, a “mosaic” approach was used in creating the model in that elements of the model were identified and taken from studies found through the literature review as well as interviews with construction industry experts. The stock and flow structure of the study’s model is intended to be a composite of many construction projects and can be used for any project delivered using the design-bid-build methodology. From the research, the model was created and tested using good modeling practice in that the model testing phase followed the process created by one of the pre-eminent system dynamic modelers in the world (refer to Sterman, 2000). The result is a model that simulates the work flow of labor hours in a design-bid-build construction project which can be affected by an immeasurable number of influences that can and do occur on construction projects.